As at the date of publication, the Loonie rallied reaching its highest point in more than three weeks against the Greenback, trading at 77.5 US¢/CAD. South of the border, the U.S. dollar dipped to a nine-week low against a basket of major currencies. Amongst attributing factors are the Fed’s monetary tightening plans. As widely anticipated, the Bank of Canada (“BoC”) opted to maintain its overnight rate at 1.50% in its September policy statement where Governor Stephen Poloz’s noted that trade tensions remain a headline risk. Conversely, the BoC made it clear in its announcement that it intends to continue its monetary tightening in October. As the Canadian economy slowly recovers, a rate hike may be warranted to achieve the inflation target. Desjardins highlighted that the U.S. economy rebounded as real GDP rose to an annualized pace of 4.2%, adding that in Canada, despite the trade uncertainties, the outlook for economic growth remains fairly good. National added that the Greenback is set to remain strong over the near term; however it casts doubts over the longer term due to the bloating U.S. budget deficit and fading impacts of fiscal stimulus. Presuming there is an agreement between Ottawa and Washington for a trade deal, the surveyed banks are in consensus that the Loonie will appreciate versus the Greenback, with BMO anticipating the CAD to break out of its current range to the strong side at the end of year, averaging 78.4 USȼ/CAD by end 2018. Overall, the currency pair is forecasted to trade between 75.0 and 80.0 USȼ/CAD by Q4 of 2019. On September 13th, the European Central Bank (“ECB”) outlined its plans to end its current Quantitative Easing (“QE”) program by end of 2018, and expects to maintain current rates through at least the summer of 2019. On the policy front, tariff risks have yet to subside as President Trump’s recent rhetoric has signaled that they are still on the table. Additionally, as noted by RBC, the EUR continues to suffer due to the populist government in Italy where political headwinds are increasingly affecting the country’s economy. Despite the above mentioned points, Desjardins is optimistic about the future of the currency adding that it has potential to bounce back sharply over the coming year. Overall, the general consensus amongst the surveyed banks is for the EUR to rally against the CAD, forecasting the pair to trade between 58.6 and 65.1 EUR¢/CAD by the end of 2019, versus 65.8 EUR¢/CAD at time of publication. RBC highlights that although the BoC held interest rates steady in September, the tone of the policy statement was relatively hawkish. Core inflation metrics have now averaged the 2.0% target and now that household debt is appearing to stabilize, an overnight policy rate of 2.0% is in sight according to BMO. Further, RBC notes that a federal rate hike at the FOMC September meeting “looks like a slam dunk” as the unemployment rate has now fallen below 4.0% (only the second time since 1969). Overall, the surveyed banks are in consensus that September and October rate hikes are to be expected in the U.S. and Canada respectively. Compared to last month’s publication, the surveyed banks made minor upward adjustments for both Canadian and U.S. short term bonds forecasts. 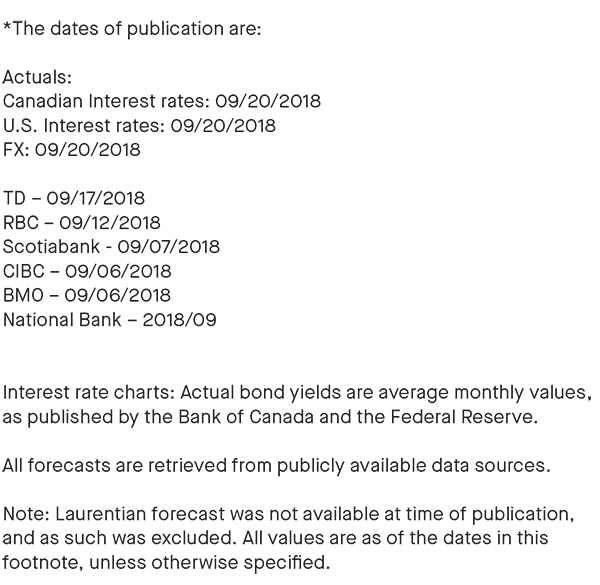 As of the date of publication, the 2 year government bond yielded 2.18% in Canada, and 2.81% in the U.S. TD highlights if there was resolution of trade risk, markets would likely price a faster pace of rate hikes by the BoC where they expect the current rate differential in the Canada-U.S. 2 year government yields to narrow by approximately 0.30% and 0.40%. Collectively, the surveyed banks expect the 2 year government bonds to yield between 2.40% and 2.60% in Canada, and between 3.10% and 3.60% in the U.S. through 2019. 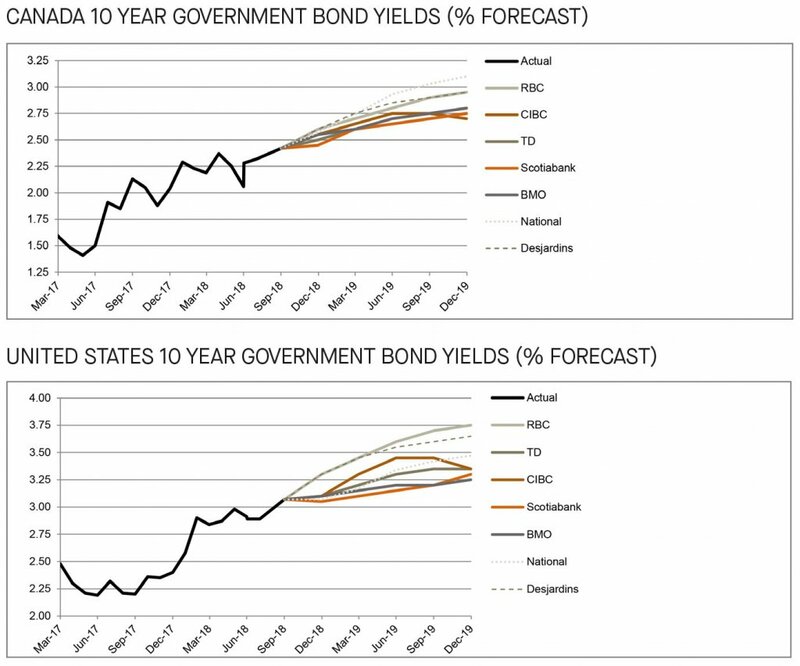 Compared to last month’s publication, we observe minor upward adjustments for the Canadian and U.S. 10 year bond yield forecasts. In the U.S., BMO anticipates higher yields due to a mounting positive output gap, a low jobless rate and inflation rates that are poised to push above the FOMC’s 2.0% target. In Canada, based on the BoC’s anticipated hikes, National expects the 10 year Canada bonds to trade around 2.57% by the end of the year and moving upwards to 3.0% in Q2 of 2019. 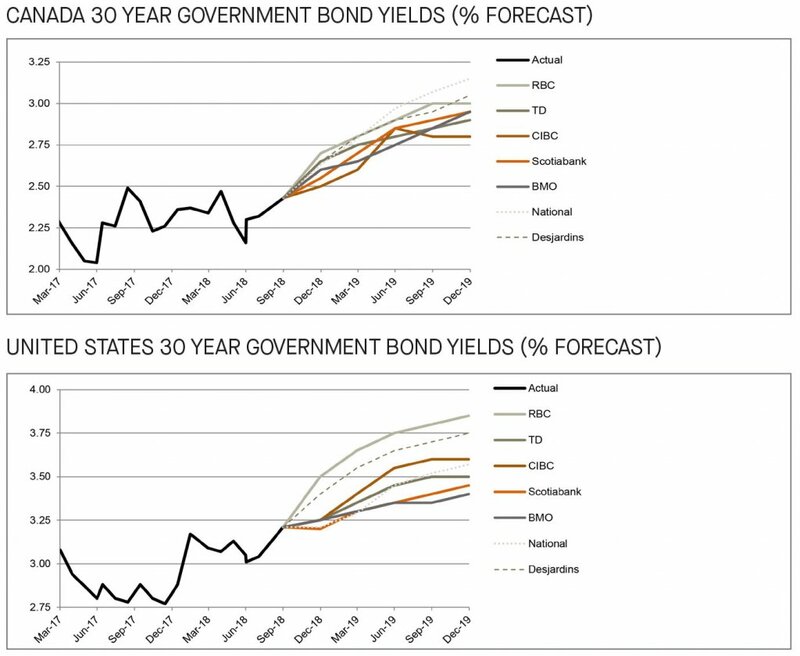 Overall, the 10 year government bonds are forecasted to yield between 2.80% and 3.10% in Canada and 3.30% and 3.80% in the U.S. by the end of 2019. 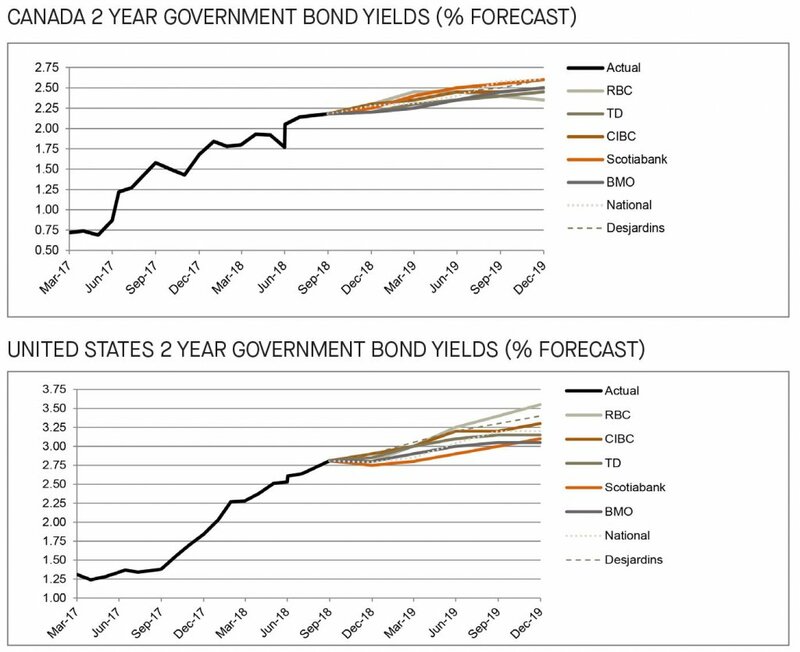 The long term bond yield forecasts for both Canada and the U.S. saw both minor upward and downward adjustments by the surveyed banks. Despite the adjustments and consistent with last month’s publication, the expectations of an upward trend for the Canadian and the U.S. long bond yields remains intact through 2019. 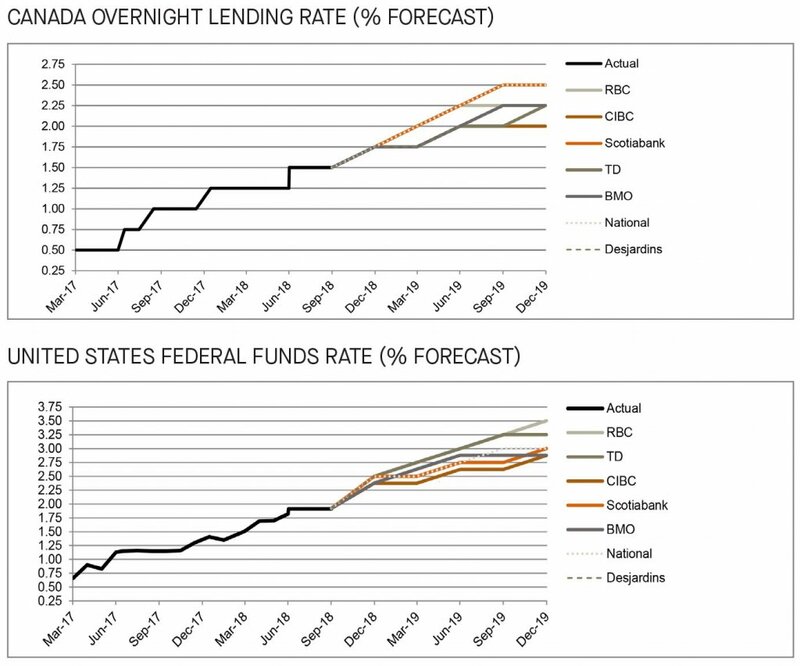 National remains on the high end of the Canadian forecasts, whilst RBC is on the high end of the U.S. forecasts, expecting the long term bond yields to rise to 3.15% and 3.85%, respectively.